The Common Firecrest, also simply just known as the Firecrest, is a small passerine bird that belongs to the kinglet family. It was first scientifically described by Coenraad Jacob Temminck in 1820. It is found all over temperate Europe and north-western Africa. It is a partially migratory bird. This bird is small and plump. 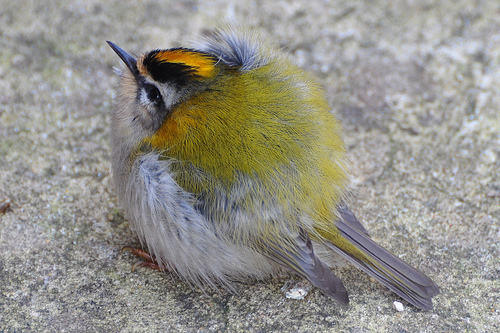 The Common Firecrest is 9 cm long and has a potential wingspan of up to 16 cm, depending on the specimen. It is very light as it weighs only 4 to 7 grams. Its upperparts are a bright olive-green, and it has bronze-coloured patches on each shoulder. Its underparts are whitish. The pattern on its head is rather striking as it has a black eye s tripe, a bright yellow crest in females and orange in males. 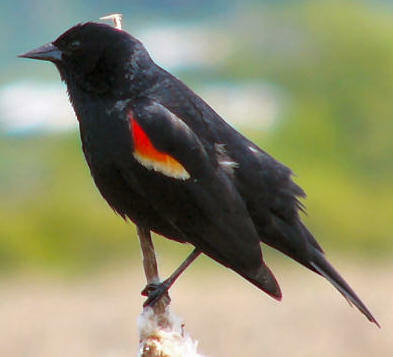 Females have slightly duller plumage and are slightly smaller on average. On the other hand, juvenile Common Firecrests have a grey tinge to its duller upperparts and do not have much of a coloured crown. Its head markings are present but are duller than adults. 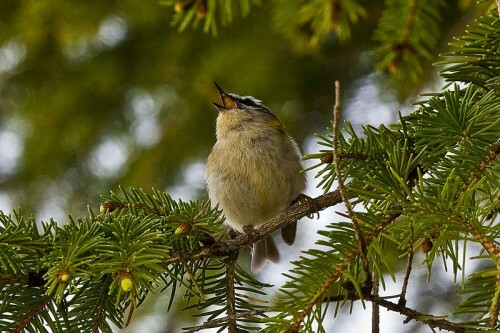 The Common Firecrest will breed in lowland broadleaf forests. They prefer alder, cork oak, holly, and beech. In the drier Mediterranean climate, they prefer evergreen oak, conifers, and mixed woodlands up to altitutudes of 2,800 metres. They do not require large woodlands and population density is independent regardless of the size of the forest. During the winter it is not really reliant on conifers as it will move from the forest fringes to the scrub. Common Firecrests are usually found in pairs or alone, and they spend a lot of their time in tree canopies. However, some will frequently venture into lower vegetation such as bushes. The nominate sub-species breeds in Europe, as far west as southern England, Spain, France, and Portugal. It will breed as fa east as the Ukraine, Belgarus, Greece; as far north as the Baltic, and as far south as Latvia. There are also isolated populations in the Crimea and Turkey. Southern birds are found in Tunisia, Algeria, Morocco, and the Balearic islands. They are a vagrant in Lebanon, Egypt, Cyprus, Estonia, Finland, and Norway. Could this be the King of the Birds? Pliny the Elder and Aristotle knew about these birds in a legend. In this legend, there was a contest amongst the birds where the winner would be able to see their king. This title would be awarded to the bird that could fly the highest. It looked as though the eagle would initially win, but this bird began to tire. Suddenly, a small bird which had actually hidden under the eagle’s tail feathers began to emerge and fly even higher. This bird claimed the title. Although this folklore was applied to the Wren which is described as the king of the birds or as the flame bearer, this was also applied to the Goldcrest and the Firecrest which are more likely to be the original bearer of these titles.